Meet the hardliners who now run China’s foreign policy. Each year, the Association of Southeast Asian Nations (ASEAN) and its affiliated organizations hold hundreds of meetings, at which officials from countries across Asia come together to issue bland, verbose communiqués about everything from agriculture management to the handling of spiny dogfish and to listen to interchangeable speeches by government officials. Along with an inevitable level of boredom, the meetings feature exaggerated, affected displays of courtesy that would not have been out of place at the Tudor Court. Attendees address each other as “your excellency” and keep up constant streams of flattery. All of which made the events at last July’s ASEAN Regional Forum, held in Hanoi, rather unusual. On the sidelines of the meeting, several Southeast Asian nations, fearful of China’s growing power, had been pushing the United States to reassert a larger role in the region, particularly to mediate disputes in the contested South China Sea, which China claims almost in its entirety. When Secretary of State Hillary Clinton endorsed these countries’ demands—declaring that freedom on the South China Sea was in America’s “national interest”—Chinese Foreign Minister Yang Jiechi lost his composure. According to several reports, he suddenly got up and exited the meeting. One hour later, he returned and launched into a 30-minute-long monologue. At one point, Yang mocked his hosts, the Vietnamese; at another, he declared, “China is a big country and other countries are small countries, and that’s just a fact.” Yang stared down the foreign minister of Singapore, a country known in the region as one of America’s staunchest friends. The Singaporean foreign minister, a normally placid man named George Yeo, stared right back. Yang’s explosion may have been out of character for an ASEAN meeting. (It was also out of character for Yang, a normally suave glad-hander, who is known as a moderate.) But it was not out of character for today’s Chinese government. The banal diplomatic scenes that emerged from Washington last week—Chinese President Hu Jintao and Barack Obama smiling for the cameras, enjoying dinner with stars like Barbra Streisand, and exchanging conciliatory words on human rights—belied a very different reality: China has spent much of the past two years provoking its neighbors—and the United States as well. Last year, China sent ten warships through international waters just off the Japanese island of Okinawa, while Chinese naval helicopters flew dangerously close to Japanese ships. Then, in September, when the Japanese coast guard detained a Chinese fisherman following a collision in disputed waters, Beijing went ballistic, cutting off Japan’s shipments of rare earths—the minerals critical to modern technologies like cell phones. China has also aggressively detained Vietnamese ships and menaced Indonesian vessels in disputed waters. It reacted angrily to the Nobel Peace Prize Committee’s decision to honor the pro-democracy dissident Liu Xiaobo, canceling meetings with Norwegian officials and warning European nations not to send emissaries to the ceremony. And, earlier this month, it humiliated Defense Secretary Robert Gates by testing a new stealth fighter only hours before he was due to meet with President Hu in Beijing. “We see a totally different China now,” says one senior Southeast Asian official. “You can see their real face now.” Indeed, what makes all this so remarkable is that, a mere ten years ago, Chinese foreign policy was the very opposite of provocative; it was restrained and modest. But the government in Beijing has undergone a dramatic internal transformation over the past decade. And that transformation has profoundly changed the way China relates to the rest of the world. 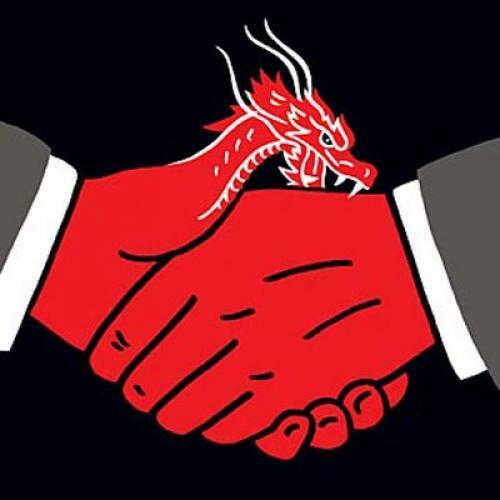 But, even as China was courting friends, subtle shifts were underway in Beijing that would eventually change the trajectory of the country’s foreign policy. The most important shift—the one that, in some sense, paved the way for all the others—was the declining power of the men who sat atop the Communist Party. Deng Xiaoping, who ruled China until the 1990s, was a veteran of the Long March and a towering figure in the country’s history. As a result, he commanded enough prestige and respect to dominate the State Council (similar to the Cabinet) and sideline potential critics. But, after Deng’s retirement and later death, successive leaders—who were younger or lacked military experience—did not enjoy the same wide-ranging authority. It may sound odd that the weakening of Communist politicians would cause China to become more anti-Western. But, when you look at the entities that have grown stronger as these politicians have grown weaker, you begin to understand why China’s foreign policy has shifted. The most important of these entities is the People’s Liberation Army (PLA). As China’s military strength has improved in recent years, the PLA’s top officers have become less willing to show deference to the Communist Party’s civilian leaders. Instead, argues Jin Canrong, a foreign policy specialist at Renmin University in Beijing, the PLA has begun to view itself as the most important guarantor of China’s safety and national interests. A study of Chinese foreign policy by the Stockholm International Peace Research Institute (SIPRI) notes that the military increasingly has been pushing its own opinions through Chinese think tanks. Some officers now write pieces in think tank publications and circulate among think tankers at conferences—neither of which was common in the past. According to one Chinese official, the military never liked a softer line on a lot of foreign policy issues, but only now does it have real political power. On several occasions in the past decade, the PLA appears to have purposely initiated or escalated international disputes in order to nudge Chinese policy in a more hawkish direction. At a multilateral conference in Singapore in 2009, for instance, a top Chinese general blasted the United States. As for the stealth fighter test that trampled on Secretary Gates’s visit to Beijing earlier this month: President Hu seemed surprised that the test had taken place, suggesting that the PLA had ordered it without civilian approval. The PLA also appears to have formed a tentative alliance with powerful Chinese energy companies—which have embarked on a global hunt for resources—in pushing a more aggressive foreign policy. Often, senior managers of the energy companies employ former PLA officers. The energy companies are linked to the government—their leaders are high-ranking members of the Communist Party—but, unlike in the era of Mao or even in the 1980s, they now compete with each other and don’t necessarily follow government dictates. In 2006, Chinese oil giant CNOOC launched exploration of oil fields in contested waters between China and Japan, even though Beijing’s leaders had not yet worked out any kind of agreement on how to divide the field with Tokyo. The energy firms have also been major drivers behind China’s expansion into Africa, particularly in countries like Angola that are key petroleum suppliers. China’s middle class has played a role in Beijing’s turn toward an aggressive foreign policy as well. More than many outsiders realize, the Communist Party today stays in power mostly by co-opting, not controlling, the urban middle class. So Beijing has to at least take into account public opinion, which, especially online, can be virulently nationalistic. In one famous incident, an online video called “2008 China Stand Up!”—which matched pictures and video clips with stirring music in order to depict a new cold war between China and the West—quickly attracted millions of views. According to the SIPRI study, “Nationalist sentiment is widespread and criticism of Chinese leaders for bowing to international demands is incessant on the Internet. ... Chinese officials are aware that dissatisfaction can give rise to questioning of the Party’s ability to govern.” In 2008, Beijing actually reacted fairly mildly at first to demonstrations in Tibet. But eventually it opted for a bloody crackdown, which was cheered on in the Chinese blogosphere. Academics have also exercised growing influence over foreign affairs. In the past, virtually all policy analysis was done within the government itself. But, over the past decade, China has developed its own brand of think tank, mostly located in Shanghai and Beijing, though there are some in provincial cities as well. They are not fully independent of the government—many are linked to the Communist Party in various ways or receive some government funding—but they have a degree of independence that would have been unthinkable in the past. Many of the people who populate these think tanks came of age after the Cultural Revolution, and so they do not remember a time when China was extremely poor, weak, and internationally isolated. They know only a world in which China has enjoyed rising economic and political power—yet still the United States controls sea lanes and meddles in Asia. Resentment toward this state of affairs underpins their worldview. While some Chinese academics argue for a relatively humble foreign policy, many academics—and some officers—have argued that the United States is trying to encircle China by building alliances with countries like Afghanistan, India, the Philippines, and Vietnam. One of the country’s most prominent scholars, a professor at Fudan University in Shanghai named Shen Dingli, exemplifies the nationalist views of some of these academics. An early advocate of a turn toward a more hawkish foreign policy and a brilliant thinker educated in part at Princeton, Shen has promoted a thoughtful but increasingly tough Chinese strategy, arguing that the United States should take a lower-profile role in the South China Sea. Unlike Chinese academics in earlier eras, who did not play the political game, Shen has cultivated close contacts with senior officials. It didn’t hurt the hawks’ case that many foreign leaders and pundits echoed this theme, praising China’s stability during the crisis and declaring that Beijing was ready to be a great power. The New York Times’s Thomas Friedman repeated this mantra so often he should have charged Beijing for his p.r., at one point writing, in reference to China, “One party can just impose the politically difficult but critically important policies needed to move a society forward.” And Friedman was hardly alone: Other prominent policy experts released books with titles like When China Rules the World and The Beijing Consensus. Meanwhile, with Washington and Europe distracted by their own problems, they became far more willing to accommodate China. Shortly after taking office, the Obama administration made clear that it would take a more hands-off approach to China than its predecessors. Secretary of State Clinton announced that human rights would now occupy a lower priority in U.S.-China relations. Bending to Chinese pressure, Obama allowed the Dalai Lama to visit the United States without a stop at the White House, the first time an American president had ignored the Tibetan in two decades. And, while in the past many Western leaders had lectured Beijing on how it needed to open its economy faster, now countries from Ireland to the United States were nationalizing large swathes of their own economies, making it harder for them to criticize China. The nationalists in Beijing could hardly have asked for a more favorable set of circumstances to press their case. Scared of Beijing’snew demeanor, other countries in Asia are desperately seeking the help of the United States. In July, Southeast Asian nations formally invited the United States to join the East Asia Summit, a regional group, partly to balance China. Southeast Asian states also have pushed the White House to help protect their interests in the disputed South China Sea. Vietnam has built a close relationship with its former enemy, opening its ports to U.S. ships. While Japan, under the new Democratic Party government, had wanted to reduce its dependence on the United States, in recent months Tokyo has all but given up trying to build closer ties to China and has returned to shoring up its alliance with the United States. “What is different about this crisis is that it has led people to think that maybe we [Japan] have to reconsider relations with China, even if it means sacrificing trade,” Masaru Kohno, an expert on regional relations at Waseda University in Tokyo, told The Christian Science Monitor. Meanwhile, in Europe, frustration with China is building as well. “European leaders are increasingly critical of China, at least in private,” notes Charles Grant of the Center for European Reform. Joshua Kurlantzick is a special correspondent for The New Republic. This article ran in the February 17, 2011, issue of the magazine.